The first computer game I ever got was an early version of Pong. The version I got on my 14th birthday featured both pong tennis and squash. Squash had smaller bats. 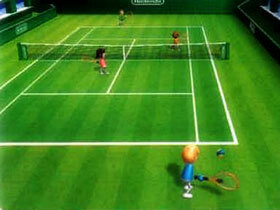 I loved that game and me and my Dad whiled many an hour away pretending we were at Wimbledon. Sadly my appreciation of games went down from there. I had an Oric1 and an Oric Atmos but neither machine were particularly good for games. I saw friends get Commodore Amiga, Sinclair Spectrum and BBC Model B computers which were all better at games but I wasn't bothered. By the time we had serious games for the PC and later the Playstation, Gamecube and Xbox I kind of saw gaming as a busman's holiday since I was sitting in front of a computer all day anyway. Later generations like the PS2, Xbox360 and PS3 have not changed my mind in any way since they just seem to be the same games with better graphics at the expense of involvement and playability. However, I am so tempted by the Nintendo Wii. Despite the well documented problems with the over ambitious use of the controllers I want one so bad. I think it might be because I get to play Tennis indoors again like I did 25 years ago.